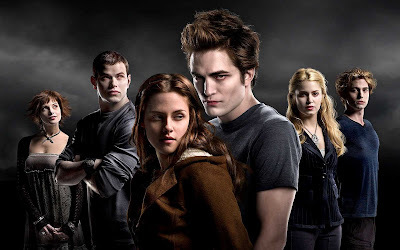 Speaking as someone who read and enjoyed Stephenie Meyer's popular teen novel, Twilight, I found Catherine Hardwicke's film adaptation, that has been greeted with mass hysteria by teenage girls all over the country, to be somewhat lacking. I've been an admirer of Hardwicke's work since Thirteen in 2003, and found quite a lot to like in her severely underrated Lords of Dogtown. But with her edgy sensibilities severely tempered in the dull The Nativity Story one of her biggest weaknesses started to become apparent - a weakness that Twilight has compounded. Hardwicke is a talented visual stylist, but in many ways a weak storyteller. There are some beautiful moments in Twilight, but they are often hampered by intrusive and inappropriate use of music and an overall lack of narrative movement. It just doesn't flow well. When you add that to the fact that many moments that seemed wondrous and magical on the page, seem hokey and contrived on the screen (Edward's supersonic running is especially laughable), then Twilight fails to live up to its full potential. Not that there was much to begin with. Quite honestly I feel it's a story better suited to the page than the screen, or at least to a director whose storytelling skills match their visual prowess. Twilight never had a strong narrative to begin with. It's filled with long passages of breathless, enraptured descriptions of Edward's beauty and Bella's burgeoning love for him. Hardwicke attempts to up the ante and keep things moving by pulling the film's villains that don't appear until the end of the novel into a series of interludes that keeps a sense of danger over the film and a semblance of a plot that really doesn't exist. It doesn't really add anything to the film but its a commendable effort. But ultimately I just didn't feel it the way I did in the book, the deep sense of longing just isn't there, nor, strangely, is the sense of danger despite the strengthened efforts in that area. I'll tap out a full review for The Dispatch for Thursday. Until then I'm left with a film I never expected to be good, that nevertheless has not hampered my enjoyment of an entertaining little piece of teen pulp fiction. But for now, I'm ready to put Twilight aside for a while. It passed critical mass on my overexposure meter a long time ago.